There is a fundamental weakness in the peoples’ movement in the United States and that is the necessity for anti-imperialist internationalism. The struggles against racism, national oppression and class exploitation cannot be separated from the need to end Washington’s and Wall Street’s interference in the internal affairs of most states throughout the world. In order to win recognition in these monumental struggles it is heavily dependent upon the degree to which we can create widespread awareness of the plight of the people of color communities and the working class in general. There are efforts underway to achieve these objectives although much more work has to be done. International consciousness in regard to the character of the U.S. state is growing immensely. This is in part due to the mass demonstrations and urban rebellions which have sprung up by and large spontaneously in response to the vigilante death of Trayvon Martin in 2012 and the not-guilty verdict handed down in the trial of George Zimmerman. When Zimmerman’s acquittal was announced it did more to turn public opinion domestically and internationally against institutions which devalue African American life and democratic rights. It was during this period that the hashtag #BlackLivesMatter began to trend. Since then there have been efforts to build BLM chapters across the U.S., spreading internationally into the United Kingdom and Latin America. Later on August 9, 2014, in Ferguson, Missouri, 18-year-old Michael Brown was gunned down by a white police officer. Immediately demonstrations erupted in Ferguson both nonviolent and violent. These manifestations spread nationally bringing attention to the false notion that America had become a so-called “post-racial society” in the period following the election of President Barack Obama in 2008. Obama, who was forced to address the problems of the “special oppression” of African Americans after the unrest in Ferguson, the situation of African Americans gained international attention prompting editorials in leading periodicals both in the U.S. and internationally questioning this false assertion of post-racialism. The administration responded in its signature dubious fashion leaning in favor of maintaining the status-quo of national oppression. Obama, of course, gave his view of what “African Americans feel” and in the next instance denounces violence saying it will not accomplish anything. This is a blatant falsehood because the U.S. state was born in violence and maintains its existence through brute force and coercion inside the country and abroad. What these developments further exposed was the failure of the Obama administration to not only have refused to address the special oppression of African Americans but to also advance a policy of public avoidance in the face of worsening social conditions. It was the African American masses and other oppressed groups who suffered the brunt of the economic crisis beginning in 2007. Detroit was one of the hardest hit urban areas and when Obama came into office in 2009, there was considerable “false hope” that these difficulties would attract the attention of the White House and the-then majority Democratic House and Senate (2008-2010). Subsequent rebellions and waves of mass demonstrations in the streets, campuses, and now athletic fields, have stripped the administration of any pretense of political legitimacy. Colin Kapernick and others within professional, college and high school sports settings illustrated that no matter how they are classified as “privileged”, the specter of racist violence remains within their purview. No matter how “privileged” these people are the threats from the armed agents of the state remains with them at all times. Racism is on the increase in the U.S. and the refusal of the ruling class and the capitalist state to advance any reforms in this regard speaks volumes about the current phases of imperialism and its public posture. The degree to which the capitalist class can claim any semblance of a “recovery” is related to the expansion of low-wage labor and the mega-profits of transnational corporations. This is reinforced by the systematic defunding of public education, municipal services and environmental safeguards. There are examples too numerous to outline within the context of this presentation. We could speak about the undemocratic system of emergency management and forced bankruptcy in Detroit and other Michigan cities that have majority African American populations. There is also the water crisis in Flint and the near collapse of public schools in Detroit, Highland Park, Inkster and other cities. A nationally-coordinated movement led by trade unions demanding a minimum wage of $15 per hour is growing immensely across the country. People of all generations are working more for less money. The prison-industrial-complex, now encompassing approximately 2.2 million people, with millions more under judicial and law-enforcement supervision, represents another form of super-exploitation and social containment that is connected to racial profiling and the unjust court system. These are some of the principal issues we must take up in the U.S. Our internationalism must be informed by the specific conditions of the workers and oppressed and the movements that have sprung up in the last four years. In conclusion we would like to point to some of the major areas of U.S. imperialist interventions and the need to make comparisons to what is happening domestically. Perhaps the most profound crisis today of displacement is starkly revealed by the migration from North Africa into Southern Europe. This movement of dislocated persons has been documented by the United Nations Refugee Agency as the largest since the conclusion of World War II. There are 60 to 75 million people who have been internally and externally displaced in the modern world. These forced removals stem directly from the foreign policy imperatives of war and economic exploitation engineered by Washington and Wall Street. The interventions in Afghanistan, Iraq, Haiti, Libya, Yemen and Somalia are fueling underdevelopment and balkanization. Many of these wars remain largely hidden from people in the U.S. Much of the social impact of these wars of regime-change and genocide are being manifested inside these geo-political regions and in Southern, Central and Eastern Europe. Nonetheless, the crisis of imperialist war has its economic components. The overproduction of oil and other commodities are driving down prices and consequently engendering higher rates of joblessness, poverty, food deficits, class conflicts and civil war. Countries such as Somalia, South Africa, Zimbabwe, and Nigeria, rich in natural resources, land and strategic waterways are facing varying levels of recession, depression and further enslavement to international finance capital. Finally, it is our task at present to point to the direct relationship between U.S. domestic and foreign policy. A policy of national oppression inside the U.S. is reflected in the military and economic destruction of countries from the former Soviet Union and Eastern Europe, extending across Africa, the Middle East, the Asia–Pacific, Latin America and the Caribbean. The problems we are facing in North America cannot be effectively tackled or solved independent of the people of the international community. 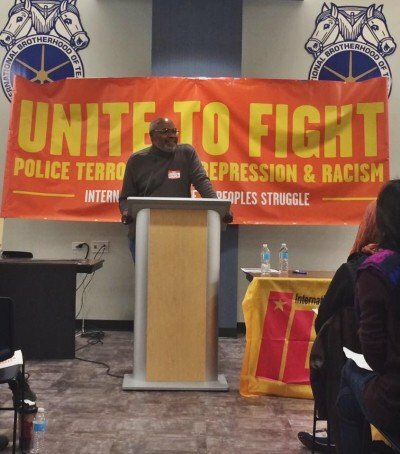 The world’s peoples must unite in a program of anti-imperialism aimed at ending all forms of oppression and exploitation. The above text is is a paper delivered at the ILPS U.S. Chapter national conference held on October 22, 2016 at Teamster City in Chicago, Illinois. The event was attended by several hundred delegates who participated in the panels, workshops and cultural presentations as well as an evening march through the Magnificent Mile retail district in the Loop opposing police brutality in honor of Laquan McDonald who was gunned down by the police prompting a citywide civil disobedience campaign during November and December 2015. The author attended the founding ILPS U.S. Chapter congress in May 2012 also held in Chicago. Azikiwe began his presentation acknowledging the 50th anniversary of the formation of the Black Panther Party for Self Defense in October 1966.